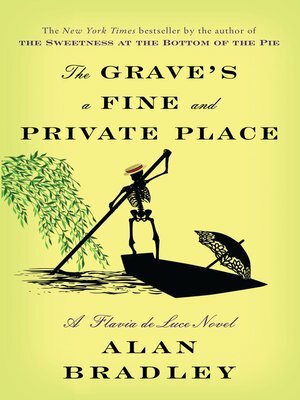 "The world's greatest adolescent British chemist/busybody/sleuth" (The Seattle Times), Flavia de Luce, returns in a twisty mystery novel from award-winning author Alan Bradley. In the wake of an unthinkable family tragedy, twelve-year-old Flavia de Luce is struggling to fill her empty days. For a needed escape, Dogger, the loyal family servant, suggests a boating trip for Flavia and her two older sisters. As their punt drifts past the church where a notorious vicar had recently dispatched three of his female parishioners by spiking their communion wine with cyanide, Flavia, an expert chemist with a passion for poisons, is ecstatic. Suddenly something grazes her fingers as she dangles them in the water. She clamps down on the object, imagining herself Ernest Hemingway battling a marlin, and pulls up what she expects will be a giant fish. But in Flavia's grip is something far better: a human head, attached to a human body. If anything could take Flavia's mind off sorrow, it is solving a murder—although one that may lead the young sleuth to an early grave.